This was so much better than the first volume! Or maybe I finally got used to the style. Either way, I enjoyed it and was constantly giggling at characters and their shenanigans! Seo and Waka combination is so cute!!!! The raccoons are cute too!!!! Everything is so cute here!!!! At times the humor loses me, and at others it has me crying tears of laughter. Tetap Kocak!Alur ceritanya terbagi menjadi lembaran dengan kekonyolan yang muncul di akhir setiap kejadiannya. Nozaki melakukan hampir seluruh aktivitasnya demi mendapatkan bahan untuk komiknya, kepalanya benar-benar hanya berisikan komik. Seperti saat Nozaki menghadiahi baju seragam sailor pada Sakura supaya bisa mendapat gambar figur cewek atau saat Nozaki memberikan bekal kepada Sakura agar dia dapat merasakan perasaan tokohnya. Sama sekali tidak mempertimbangkan bakal muncul perasaan ge-er pada si perempuan yang kenyataannya memang munculKejadian paling kocak adalah saat Wakamatsu akan melakukan aksi lempar sarung tangan kepada Yuzuki, cewek yang paling dibencinya. Adegan menjadikan jas Nozaki sebagai pengganti payung atau percakapan tentang editor masih menjadi bahan yang lucu di komik ini. More fun and cute comics! I still love the peek into comics-making life and laugh at the ones that I can relate to. bikin ngakak bingits. konyol banget sih ini komikusnya.btw, ada istilah-istilah komik yang gak aku paham dan gak ada catatan kakinya jadi harus gugling semisal esper, lolicon, dsb. I think the Gekkan Shoujo Nozaki-kun (月刊少女野崎くん) series does definitely encourage those who pay attention to it to give the process of making it a try, however possible! Like as in putting in the toner, or drawing, or whatever. Oh! According to Wikipedia it is currently ongoing, as of July 1, 2017! I have never actually read a currently running series before! (Although it looks like they're going to put the last one out in EN in about two weeks. )THAT'S SOOO COOL ♥ it made me decide to rate it a little higher than I was originally going to, to be quite honest!So, this is the second volume of a Japanese romantic comic, where the heroine Sakura does busywork for the mangaka named Nozaki. I enjoyed it! You may, as well, if you're okay with girly-girl stuff and hot guys falling for each other. I felt like this volume was even funnier, some great new characters were introduced and they brought a lot of humor. The story is really building even though it's told in four panels, though I don't know that it's building to anything in particular, it's all just very related. I don't think there necessarily will ever be a climax to the story, but I like this kind of high school life story told in short humorous events rather than drawn out dramas. This series is really funny so far. In particular Wakamatsu being bullied by Yuzukiseo and being unaware of the fact he likes her singing voice. Also he can't help but be kind and not confrontational. I'm glad he's part of Nozaki's manga group, even if his title is just "erases stuff". Kashima is quickly becoming one of my favorites. She is just so overly confident and I like her dysfunctional friendship(?) with Hori. Mikoshiba is always excellent(and horrifically romantic). This Manga series follows a cast of characters, one of whom is secretly a popular manga artist. It’s been a while since I read the first volume and I spent the first chapter or so wondering why I had liked it so much, but it wasn’t long before I was laughing out loud! This manga is perfect for manga readers/artists. The characters are lovable and hilarious! I will definitely continue with the series! Nothing more I can say that I didn't about book 1, this series is one of the view I can watch over and over again and bust a gut laughting even though I know exactly what followup is going to happen next. The constrained format and the expressiveness of the art is amazing and timeless.Somehow subversive without ever heading into darkness or heaviness (or sexually overtoned for that matter, which is how most light animes tend to swing), I would love to see more things like it. *pig snort*There's so many aspect of manga making process and art.I'm estatic.A new character is introduced. *seal clapping*The cover illustration is so misleading imao.My friend thought I was reading romance manga and that Mikorin is the love interest. *hyena laugh*Even the color page inside gives off that vibe,this artist is such a troll lol. 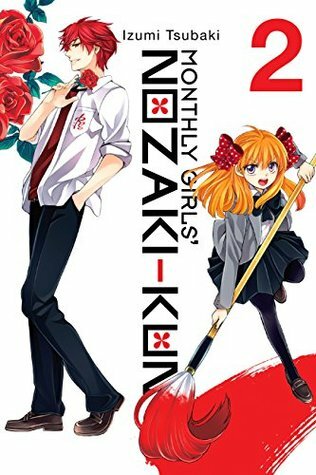 I love this series and vol 2 has some of my favorite moments in "Monthly Girls' Nozaki-kun" with the umbrella chapter, Seo and Wakatmatsu being completely obvious and oblivious at the same time, Kashima always, and then the gang trying to help Nozaki get a chapter out when he's ill. I don't remember high school ever being like the one portrayed here, but I sure wish it had been. This series is a delight. Volume 2 includes an explanation of tone, a sticker-like pre-made background mangaka use. Pretty informative, and useful for the story arc that involves Nozaki'kun's "staff" trying to apply it. This is so funny, and so hard to explain to anyone who isn't intimately familiar with all the tropes of shoujo manga. This author really is suited to 4koma gag comics and to casts with fewer characters. I like it, but I feel there hasn't been much story progress. Sedikit-sedikit jadi paham apa itu beta, name, tone ^^. Tapi, sekarang dunia digital makin berkembang. Banyak yang gambar pakai komputer. Berarti nggak perlu tone kayak di komik ini dong ya. This is easily one of the best manga I’ve ever read. Great cast, fun stories. I loved the anime so much that I wanted more time with these characters and the manga has exactly what I was looking for. THIS WAS SO ADORABLE AND FUNNY AND EXACTLY WHAT I WANTED TO READ! Izumi Tsubaki - See also: 椿いづみ (Japanese name)She is a Japanese manga artist known for creating The Magic Touch and Oresama Teacher which have both been serialized on the Hana to Yume magazine.Tsubaki began drawing manga in her first year of high school. She was soon selected to be in the top 10 of Hana to Yume Mangaka Course, and subsequently won the Big Challenge contest.